Thank you for continuing to visit my Facebook page and blog. I started this visual journal eight years ago when I was covering Long Beach for the once-great Press-Telegram. My coverage migrated to the previously-daily Long Beach Register, then on to the formerly-published Los Angeles Register. Now I’ve moved south to the Orange County Register, with occasional stops inLong Beach. To that end, I’m changing the name of this blog to better reflect its content. This entry was posted in Local News on October 12, 2014 by admin. Firefighters gather in Santa Ana for the Orange County Fire Chief’s Fire Service Memorial in on Monday. Twenty nine firefighters and lifeguards who died after retirement and during the line of duty were honored. This entry was posted in Local News on October 6, 2014 by admin. The parking lot is mostly empty. Only a few people are milling about near the entrance of the building, which is set back from the street. But taking a step inside is like taking a trip into the past. The roller skating palace, which opened in 1972, is one of the few rinks left in Orange County. The rink has its regulars, like Jon Adams, 46, who skated at the rink when he was a teenager and said that except for the new carpeting, the rink looks exactly like it did when he was young. Adams likes the exercise he gets from skating, but is mostly excited to spend time with his daughter, Jasmine. He uses skating is an incentive – if she has a good week at school, she gets to spend a few hours at the rink on Thursday evenings. As skaters circle the track, they are immersed in flashing, colored lights, the sparkle of a disco ball and blaring music. There’s staffer Anthony Jones, who hangs out here when he’s not working. He made his own skates by bolting a skating frame with wood wheels to his Converse shoes. “It’s not very practical; it’s just for fun,” he said. Cameron Guyot, who hasn’t been to the rink in more than 10 years, said he and his brother used to skate when they were younger. They decided on a whim to go skating and both agreed that the rink hasn’t changed. Andre Birgen skates at Holiday three times a week. This entry was posted in Local News on September 29, 2014 by admin. The four Blue Line stations in Downtown Long Beach closed Sept. 20 for a month of renovation work. This entry was posted in Local News on September 28, 2014 by admin. Stair Climb for Los Angeles in the U.S. Bank Building in Downtown Los Angeles. About 4000 climbers hiked up 75 stories, or 1,664 stairs, to the roof. The structure is the tallest building west of the Mississippi. This entry was posted in Local News on September 19, 2014 by admin. Thousands of people line up at the Apple Store on launch day for the iPhone 6 at the Los Cerritos Center. Pepperdine University’s annual Waves of Flags display in Alumni Park at their Malibu campus on Tuesday. The display of nearly 3,000 flags pays tribute to 9/11 Victims. The flags were first flown by the university’s chapter of the College Republicans in 2008. They will be on display until September 22. This entry was posted in Local News on September 10, 2014 by admin. Damage from a fire on the Colossus roller coaster at Magic Mountain in Valencia on Monday. The iconic coaster, which closed last month, was burned by welders removing tracks on the upper section. The ride is being transformed in to a wood/hybrid called ‘Twisted Colossus’. This entry was posted in Local News on September 8, 2014 by admin. Dunkin’s first foray in to Los Angeles County opened in Santa Monica on Tuesday. This is the first full expression Dunkin’ Donuts restaurant in Southern California. The new Santa Monica restaurant, located at 1132 Wilshire Blvd., opened its doors at 5 a.m. This entry was posted in Local News on September 2, 2014 by admin. Paul Kalemkiarian bowls down wine on the loading dock of his Monrovia-based Wine of the Month Club business on Thursday. In the late eighties Paul Kalemkiarian took over his father’s mail-order wine of the month club business, the first of its kind in the U.S. Since then, he has tasted 300 wines every month to hand-select the top twelve for his customers. Bringing the business into the digital age, Kalemkiarian incorporates podcasts and video into his wine business and comes up with creative methods of disposing of the reject wines— knocking them out with a bowling ball, dropping two off the roof at the same time and clocking the bottles for speed to see which wine falls faster, and more recently, taking part in the ice bucket challenge with red wine. This entry was posted in Local News on August 28, 2014 by admin. PHOTOS: Waves… Yes, Waves, in Long Beach! 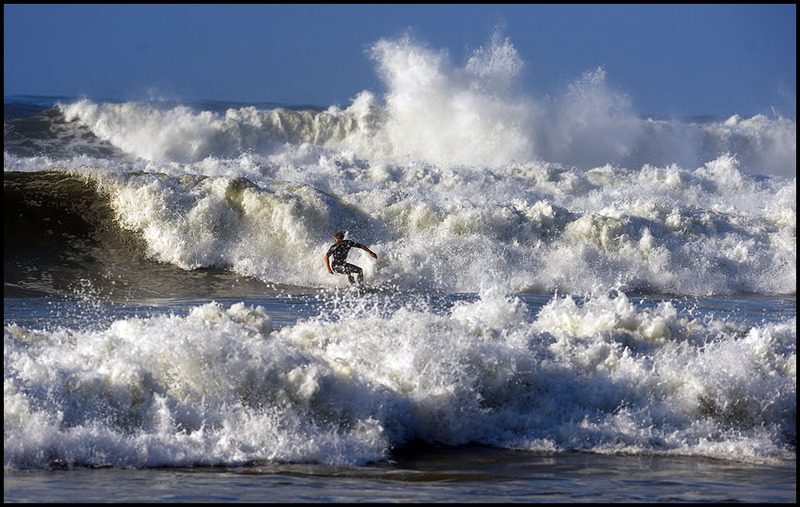 During a typical visit to the shores of Long Beach beach goers are greeted with ankle high waves. The city’s breakwater usually keeps the waves at bay. Today was different. Surfers and body boarders flocked to the peninsula where the waves were big thanks to Hurricane Marie off the coast of Baja California. City workers struggled to keep a sand berm built as it was pummeled during high tide. The water breached the sand mountain in several places, but didn’t damage any homes. This entry was posted in Local News on August 27, 2014 by admin. A surfer braves the big waves at Outer Cabrillo Beach in San Pedro on Wednesday. The new Wallis Annenberg Hall at USC on Monday. This is the new combined newsroom for digital and broadcast journalism. This entry was posted in Local News on August 25, 2014 by admin. The city of Santa Monica and RAND are studying what makes people happy and then plan to make an index with the data and use it to inform public policy, make changes to policy and also help local organizations. This entry was posted in Local News on August 22, 2014 by admin. The 2014 México Food Fair at the Los Angeles Convention Center. The food fair is a showcase of the cultural & gastronomical wealth of Mexico: food tastings, cooking lessons, demonstrations. This entry was posted in Local News on August 21, 2014 by admin. A giant yellow vinyl duck is towed under the Vincent Thomas Bridge in the Port of Los Angeles on Wednesday morning. The duck, created by Dutch artist Florentijn Hofman, will be towed to the Angels Gate Lighthouse at the tip of the breakwater and lead this afternoon’s parade is ships into the harbor. After the parade, the duck will be docked at the Downtown Harbor plaza just south of the Los Angeles Maritime Museum at Sixth Street and Harbor Boulevard. This entry was posted in Local News on August 20, 2014 by admin. Students at the California Academy of Math and Science returned to school on Tuesday in Carson. The school, a Long Beach Unified High School, starts earlier then others in the district so it can mirror neighboring Cal State Dominguez Hills. This entry was posted in Local News on August 19, 2014 by admin. Steve Ballmer, the new owner of the Los Angeles Clippers, during a fan festival at the Staples Center in Los Angeles on Monday. This entry was posted in Sports on August 18, 2014 by admin. 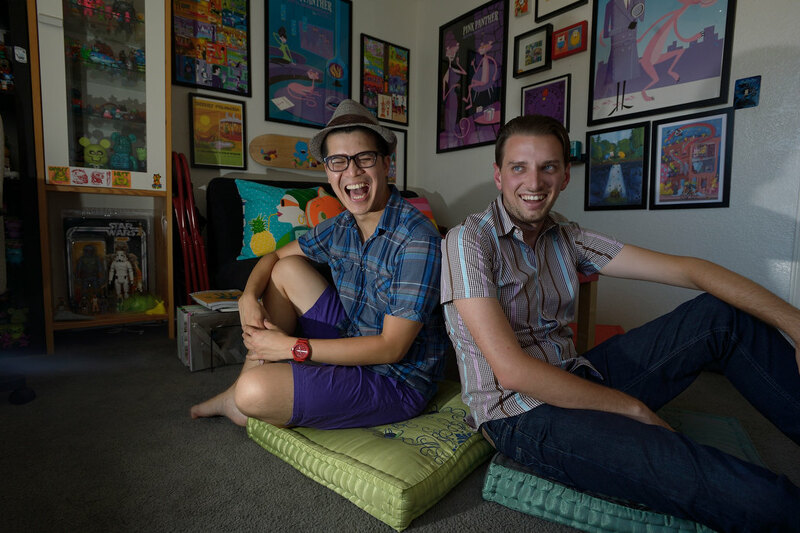 Angelo Ignacio, left, and his partner, Matthew Bates in their Long Beach apartment. The millennials are looking for a home but finding it tough to find one. A recent study has come out showing the top most and least affordable areas for this generation, and not surprisingly LA and OC are among the least affordable areas. This is driving these younger people to other areas, and to make other arrangements. This entry was posted in Local News on August 8, 2014 by admin. 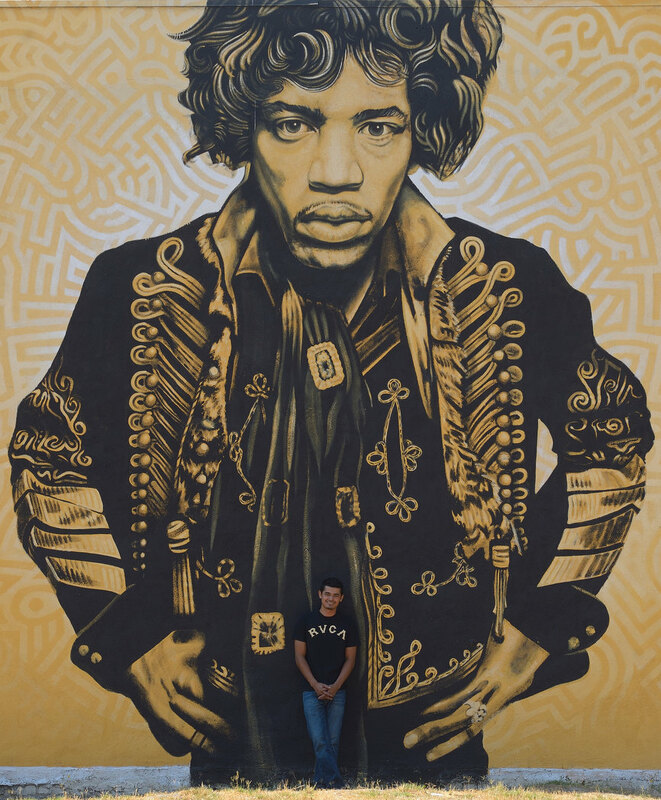 Artist Levi Ponce with his Jimi Hendrix mural in North Hollywood on Wednesday. The number of urgent cares are increasing across the country. Here is a peek a MemorialCare’s Long Beach urgent care. 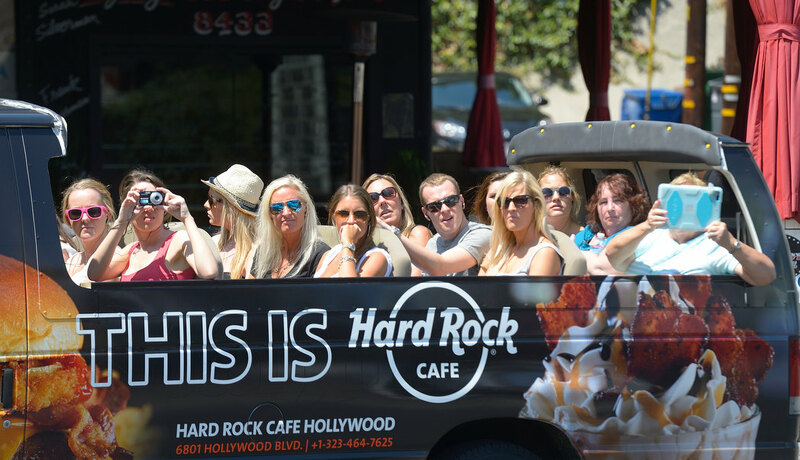 A sightseeing van shuttles tourists down the Sunset Strip on Sunset Boulevard in West Hollywood on Tuesday. This entry was posted in Local News on August 7, 2014 by admin. Diver Ali Krajewski in the kelp off Cabrillo Beach in San Pedro. Krajewski is a dive volunteer with L.A. Waterkeeper – one of several area organizations working on kelp forest restoration. She does most of her work 50 yards from shore at Underwater Arch Cove on Palos Verdes Peninsula. This entry was posted in Local News on August 4, 2014 by admin. Pat Manuel during a workout at No Limits Gym in Signal Hill. Manuel is a transgender boxer who trains non-gender conforming young people. He is working on an online gym only featuring transbodies and is emphasizing working with your body instead of beauty and gender binary that’s common in typical gyms. This entry was posted in Local News on August 3, 2014 by admin. This entry was posted in Local News on July 25, 2014 by admin. Amid recent sightings of the elusive Bryde’s whale, including two this week, the Aquarium of Pacific set out Wednesday morning to find the rare mammal. Aquarium education specialist Kera Mathes said the whale, pronounced BROO-duhz, is so rare that only 12 individuals have ever been spotted along the western coast of the United States. However, she said there are about 100 near Hawaii and more in the western Pacific Ocean. Bryde’s whales are smaller but much more populous than a more common Southern California visitor, the blue whale. The National Oceanic and Atmospheric Association estimates the Bryde whale’s total population at about 90,000 to 100,000 worldwide, compared with a few thousand blue whales globally. Bryde’s whales grow to 40 to 55 feet long, while blue whales can reach 110 feet in length. Even though Capt. Dan Salas, who was piloting Harbor Breeze’s newest ship, Triumphant, couldn’t find the scarce whale Wednesday, he did find Eileen. She is a blue whale he nicknamed for her propensity to lean to one side while diving. Salas insists that every whale is unique. So he and his crew have taken to naming them: Hook, because of a hooked tail; Curly, because of a curly tail; Nacho, who has a notch in her tail; and Bubbles, because she blows air out of her blowhole before surfacing. Visitors aboard his boat may never see the Bryde’s whale, but blue whales migrate to California and stay from June to October. Salas said he sees them, along with dolphins, almost every day. This entry was posted in Local News on July 23, 2014 by admin. Restaurant review of Bo-beau Kitchen + Roof Tap in Downtown Long Beach. This entry was posted in Local News on July 20, 2014 by admin. Newly elected leadership of Long Beach during the Inaugural Interfaith Prayer Service at Assumption Greek Orthodox Church on Tuesday. From left, CIty Attorney Charles Parkin, City Prosecutor Doug Haubert, Mayor Robert Garcia, City Auditor Laura Doud, Councilmen Al Austin, Roberto Uranga, Stacy Mungo, Suzie Price and Lena Gonzalez. This entry was posted in Local News on July 15, 2014 by admin. L.A. County Urban Search and Rescue and L.A. County Sheriff dive teams search for missing teen swimmer Joesph Sanchez at Inspiration Point off the coast of Rancho Palos Verdes on Thursday. This entry was posted in Local News on July 10, 2014 by admin. This entry was posted in Local News on July 9, 2014 by admin. Katie Bates, customer experience manager, at Syncromatics in Los Angeles. Bates is the only women at the tech company that makes tracking devices for buses. This entry was posted in Local News on July 6, 2014 by admin. This entry was posted in Local News, Seen From Above on July 6, 2014 by admin. 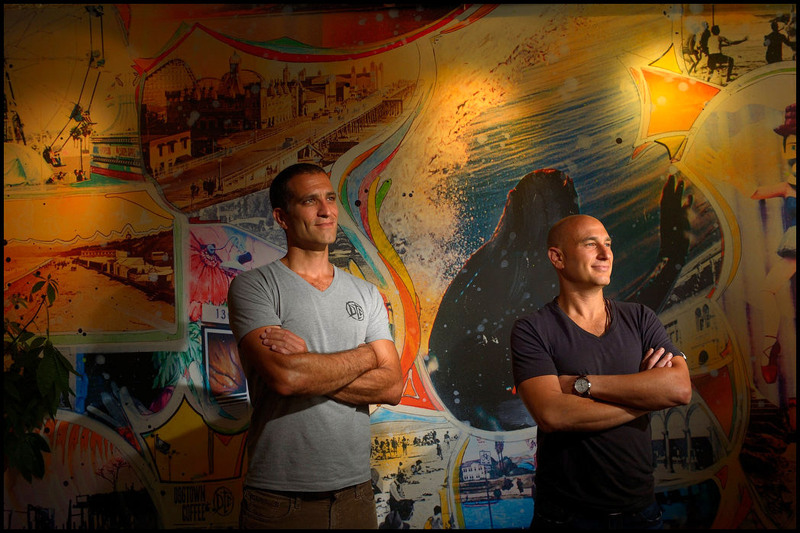 Assaf Raz, left, owner of Dogtown Realty, left, and Drew Golden, managing director of Golden Capital Partners, by a mural they had commissioned for their Santa Monica Office. The pair opened a new arts space in their historic “dogtown” surf shop building that was at the center of the Z-boys skater culture. This entry was posted in Local News on June 27, 2014 by admin. Atun Restaurant in the Bixby Knolls neighborhood of Long Beach. Lunchtime diners at Leelin Bakery and Cafe in Cerritos. The Leelin family is working to expand in to Orange County. This entry was posted in Local News on June 26, 2014 by admin. 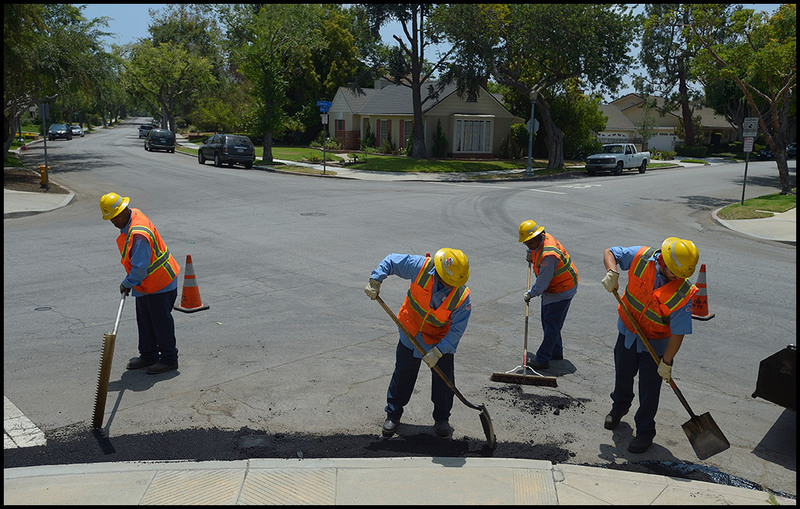 Workers repair the street at the corner of Claiborne Drive and Olive Avenue in Long Beach on Wednesday. This entry was posted in Local News on June 25, 2014 by admin. This entry was posted in Local News on June 20, 2014 by admin. 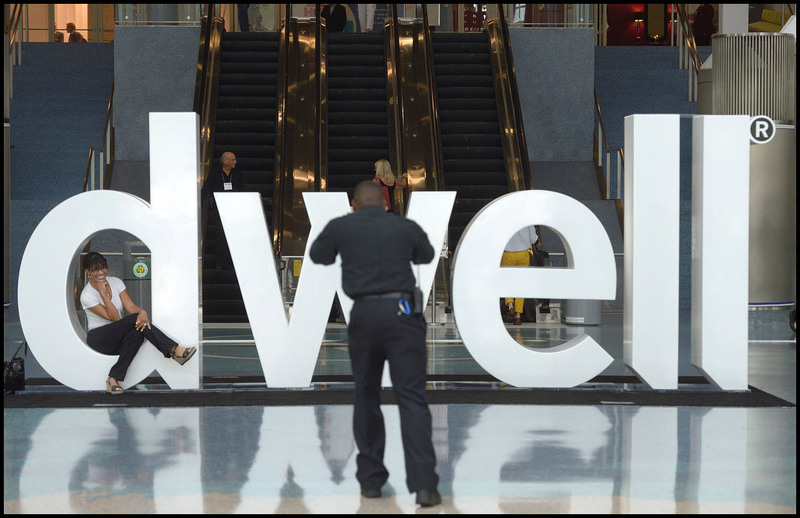 Security guard Kawan Mitchell takes a picture Linda Allen, of Linda Allen Designs, at the entrance to Dwell at the Los Angeles Convention Center on Friday.